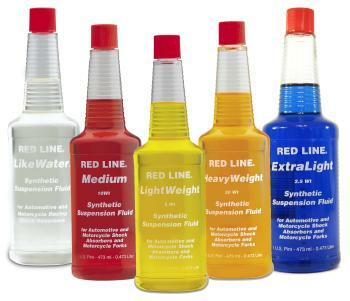 Red Line Suspension Fluid will provide very good shear stability which means that they should not degrade with use. They change very little with temperature and will provide lower operating temperatures for the same viscosity when compared to conventional suspension fluids. They are also very low foaming and provide good seal lubricity and antiwear properties. They can be blended together in any proportion to achieve an intermediate viscosity. The higher viscosity fluids are more suited for fork use. See our technical specifications for properties. This 2.5wt fluid is extremely popular in NASCAR’s professional categories, motocross, and road racing, where top engineers try to run the lightest fluid possible that maintains its viscocity and stability (allowing the shock valving and springs to perform the work, rather than the fluid…). Many motocross tuners use it as a direct replacement in the front forks on Showa and Kayaba forks, with or without revalving. Similar to what many manufacturers call a “5W” or 5-weight. This fluid is often used by CORR and SCORE off road teams in their long-travel shocks due to its ability to hold viscosity under extreme conditions. Tuners use our LightWeight Suspension Fluid as a direct replacement in the rear shock on modern motocross bikes (ExtraLight 2.5 in the front forks). NHRA’s Top Fuel and Funny Car teams also use this fluid as a substitute for the “water soluble” fluid used in their clutch management systems due to its ability to produce extremely consistent operation under both hot and cold racing conditions. Provides the least viscosity change of any commercial suspension fluid and will operate unchanged longer than other suspension fluids. Often used by NASCAR and ARCA teams in Superspeedway suspension setups.